A good friend of mine in my high school years used to have a favorite snack. Actually, I shouldn’t say “used to” because he probably still does it. Basically, he would put a block of cheddar on a plate, microwave it, and then eat it with a fork. This Sun Dried Tomato Fundido is kind of the grown up version of that. 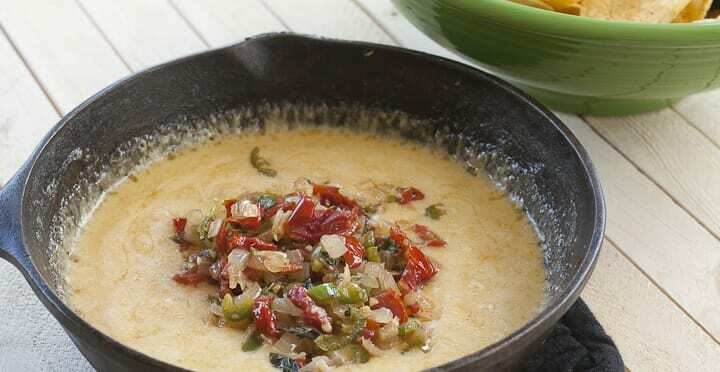 It just might be my new favorite cheese dip! Serves 2. Easy to double. Recipe for a easy and flavorful baked cheese dip topped with a delicious serrano and sun-dried tomato salsa. 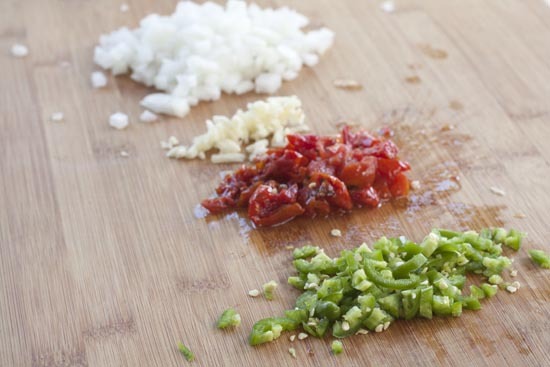 1) Finely chop onions, garlic, pepper, and sun-dried tomato. 2) In a medium cast iron skillet, add olive oil over medium-high heat. Then add onions, peppers, and tomatoes. Cook for a few minutes until soft. 3) Add in garlic and oregano and a pinch of salt. Cook for another minute being careful not to burn garlic. 4) Remove salsa and set aside until later. 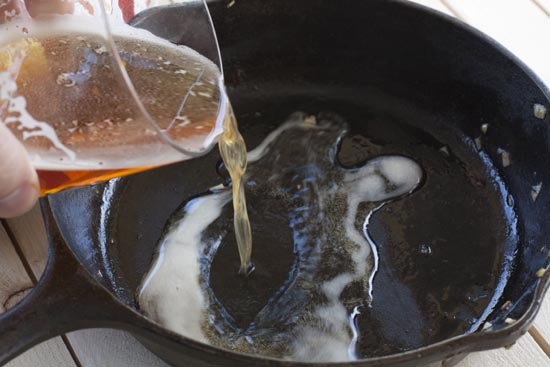 5) Add beer to cast iron skillet and use liquid to scrap up any bits on pan. 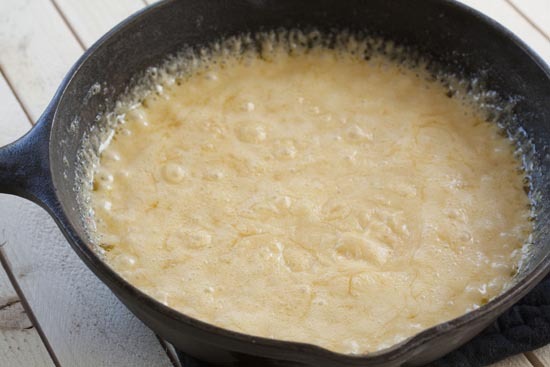 6) Toss grated cheese with flour and add to skillet. Stir to combine. The cheese should quickly melt. 7) Transfer dish to oven and bake for 15-20 minutes at 400 degrees until cheese is bubbly and starting to crisp slightly around the edges. 8) Top baked cheese with salsa and serve immediately. Any leftovers (yea right) can be reheated in the oven. A lot of fundido recipes involve chorizo or some sort of sausage, but I think the recipe works just fine without the meat. I do like to use pretty spicy peppers though (with seeds) and sun-dried tomatoes to give the small bit of salsa some real flavor. To make the salsa, just dice up all the ingredients pretty finely. You don’t want any huge chunks. This dip was made for a cast iron skillet since you cook it on the stove top, but then transfer it to the oven. 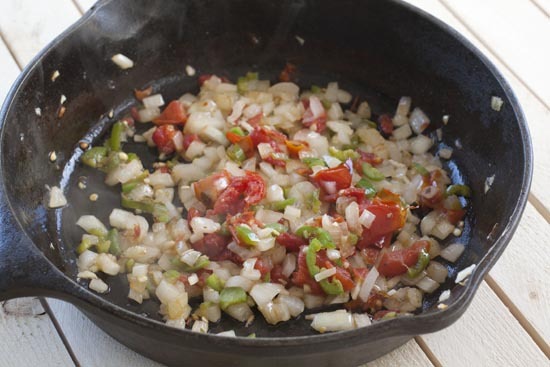 Start by adding some oil to your cast iron skillet over medium high heat. Then add the onions, peppers, and sun-dried tomatoes. Cook these for a few minutes until they soften and then add the garlic and oregano. Be careful not to burn the garlic. Add a pinch of salt and your quick cooked salsa is done! You can use a bunch of different cheeses for this dish, but obviously it’s important that they melt well. For my money, it’s hard to beat a combination of cheddar and pepper jack cheese. 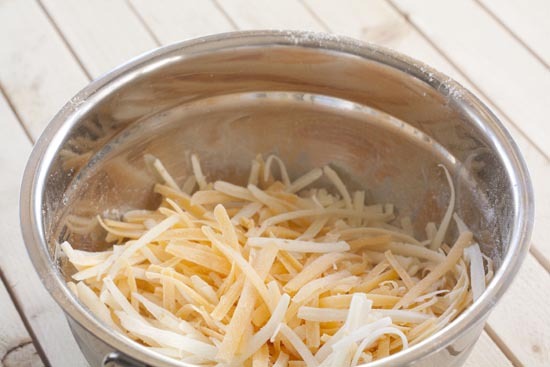 Toss the grated cheese with a small pinch of flour which just helps the baked dip thicken a bit. Just a bit of flour. Once your salsa is done, scoop it out of the pan and then pour in some lager beer. Any beer will do but maybe stay away from the super-cheap stuff. The beer will pick up all the flavors from the pan and also give you some liquid. Once your beer is in the pan, go ahead and add your cheese. Quite honestly, I wasn’t sure this was going to work and was pretty nervous about this step, but it worked great so just go with it. 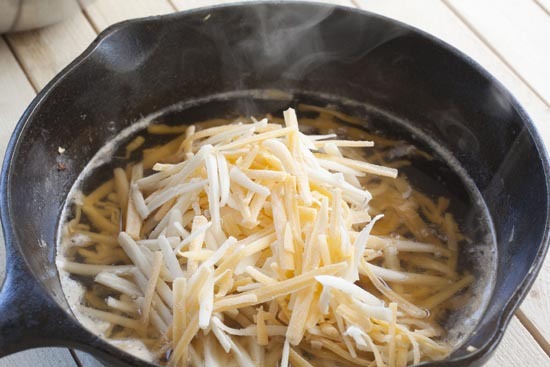 Stir the cheese and beer together over the stove until the cheese melts. Because cast iron retains heat so well, this will take all of 30 seconds. Then transfer the pan to a 400 degree oven for about 15-20 minutes. This baking time does wonders for the dip. It thickens it, intensifies the flavors, and the edges get a bit crispy which is very delicious. 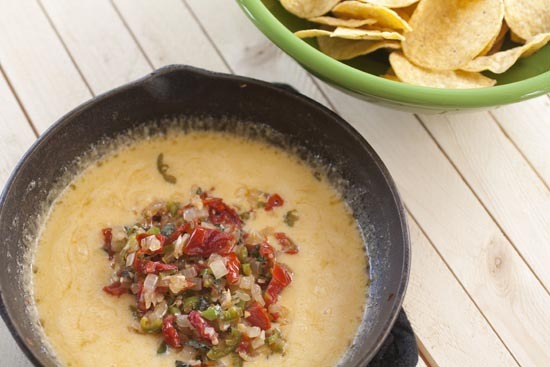 Once the dip comes out of the oven, top it with the salsa and serve it immediately! Good hearty tortilla chips are a must for this dish. Not that you’ll have leftovers, but if you do (or if the dip just cools down), you can easily reheat it in the oven for a few minutes to re-melt the cheese. Maybe it was my intense craving of Tex-Mex after our return from Peru, but I completely devoured this Sun Dried Tomato Fundido and could have it again today! Looks absolutely fabulous. And if I ate that I’d gain 5 pounds by the time I stood up. Its a great vegetarian option. In the north of México we like queso flameado ( fundido) with chorizo I want to try this healthier version. Thanks. oh I definitely still microwave cheese on a plate and eat it by the forkfull. gimme some fresh Wisconsin cheese curds to melt and I’m in heaven. 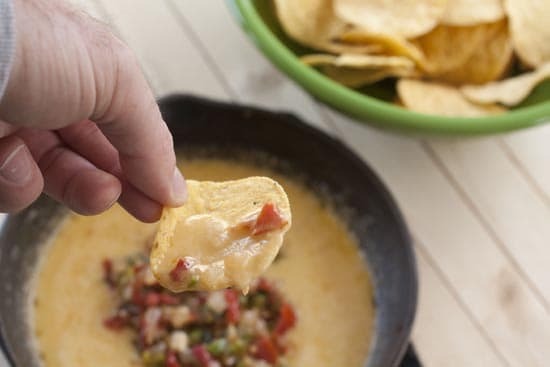 I’m somewhat embarrassed to admit that shortly after moving to TX we were at a party and there was this *amazing* cheese dip that I couldn’t stop eating and when I asked the hostess for the recipe I found out it was made with velveeta as a base. So much for being a cheese snob! I may have just snort laughed at the microwave cheese story. And I’m trying to figure out how in the world I’ve never thought of it! As for the dip, you had me at hot cheese. yes please!!! I used to top tortilla chips with shredded cheese and microwave them but no longer have a microwave. The fundido looks great. Blows away velveeta and rotel doesn’t it? I am that friend, and while I’ve graduated to slightly more sophisticated fare (I don’t use a microwave, employ multiple cheeses, and usually put the resultant “sauce” over some form of “pasta”) this recipe couldn’t come at a more perfect time! As I’m convalescing post-wisdom-toof-removal, my wife can’t possibly object to my eating a bowl of cheese! Have you ever tried this dip without the baking step? I made it twice now, and both my boyfriend and I agree that it is as good, if not better, without the baking step. I might have used a little extra cheese when I did not bake it, but it still thickened up nicely when removed from the heat. If you haven’t tried it without baking yet, I’d give it a shot. Not only was it much quicker, the cast iron cleaned up more quickly without the baking. OH yea. I eat it both ways Shanti. Sometimes I like it a bit thicker so I bake it. Personal preference really! Glad you like it! I made this for the Super Bowl. Thank you. I’ll be posting it next week with a link to your recipe. It was all kinds of heaven in my mouth. Did I say thank you?